Oh my God, what the hell? It is half past seven on Saturday morning and I am lying in bed listening to the hosing down rain – blerghhhh, I am so sick of crappy weather! It’s all well and good in the middle of winter, snuggy jumpers, hot chocolates and all that, but one month from the official start of summer and a bit of sunshine would be nice…Anhyoo, grumpy complaining aside – this tart is bloody awesome, and would be perfect for a (wet or dry) halloween dessert. It has a short chocolate base with a hint of orange, rich, smooth caramel filling and is topped with a layer of chilli-spiked dark, bitter chocolate…then the Valrhona chocolate balls are an optional little bit of fancy stuff if you’re so inclined. The combination of rich, sweet, bitter and hot is magic, and it is deceptively easy to make. Soooo, hmmm not much else happening really. I’ve had a super-quiet week which makes a nice, yet slightly disconcerting change. (Actually I’ve been feeling like a cat on a hot tin roof all week – having had such a fun time away last weekend and being surrounded by friends, it is back to being totally solo, it’s so quiet I can practically hear the clock ticking). Thinking it would be a good opportunity to get sh*t done I emptied cleaned and re-filled the spa (beloved by the Hoob). Having taken it from mouldy and a bit gross to sparkling and clean I was completely bummed to find that after re-filling it has now magically developed a bloody great leak somewhere and within three hours was empty. Thinking I could find the leak I re-filled it, aaaaand no – empty again but where is the water going – I do not know, potentially being sucked up by aliens, it is a mystery. So bloody spa aside you can see just how exciting my week has been! So, today it’s back to busy-business, I have my next lots of Cuisine and Dish recipes to get testing with Fairfax newspaper columns lining up from now until Christmas. So – happy halloween if it’s your gig, and I hope you enjoy the tart, there’ll be new recipes up again next week, see you then…(wish me luck with the mysterious case of the self-emptying spa). 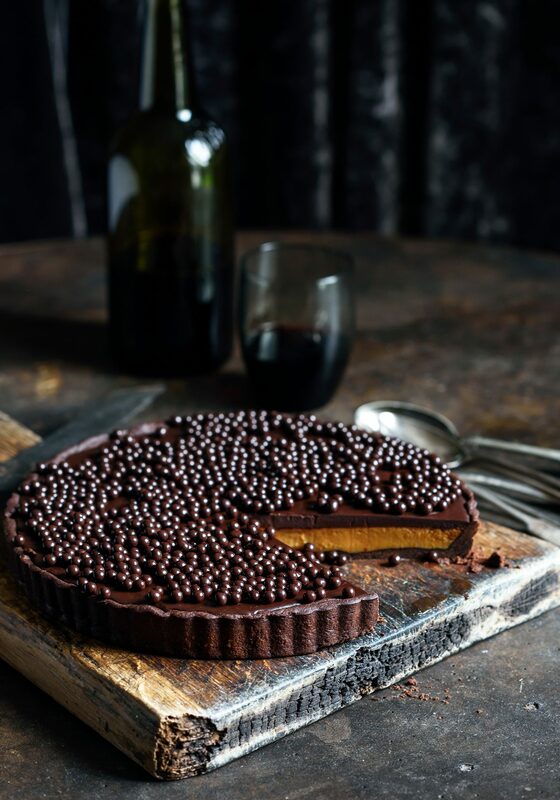 You will need a 25cm tart tin with a removable base for this recipe. Whiz flour, cocoa, icing sugar, butter and zest together in a processor . Add egg yolk and 1 – 2 teaspoons water and pulse until it starts coming together in big clumpy breadcrumbs. Tip onto a clean bench and squish together into a big fat disc, wrap in plastic wrap and chill in the fridge for 10 minutes. Remove the pastry from the fridge, sit for 5 more minutes then roll out between two pieces of baking paper until it is a few centimetres bigger in diameter than the tart tin. Carefully remove one side of baking paper and put this side down into the tin, remove the top baking paper and ease the pastry into the tin. Press firmly into the sides and base then trim excess from the top. Don’t worry if a bit of patching is required – no-one will ever see! Prick the base gently with a fork and pop in the fridge while the oven preheats to 180˚C (350˚F). (Save left-over scraps of pastry to patch any cracks after the first bake). Line the pastry with a circle of baking paper and fill with baking beans or rice and bake for 10 minutes. While it is cooking put the condensed milks, butter and golden syrup in a large microwave proof bowl. Heat in 30 second bursts, whisking between each until it is smooth and luscious. 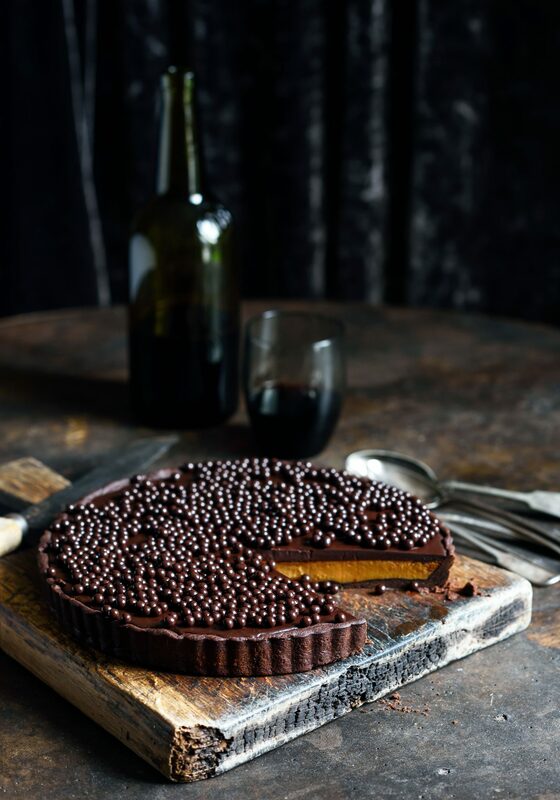 Once the base has baked for 10 minutes remove the baking paper and baking beans from pastry case and cook a further 10 minutes, then patch any cracks with leftover pastry dough and pour caramel filling into base. Cook a last 10-15 minutes until the filling is set and the pastry cooked through. Remove from the oven and allow to cool for 15 minutes. While it is cooling, heat the cream until it is simmering, remove from the heat and drop in dark chocolate. Leave for a minute then add chilli powder and orange zest and whisk to combine until smooth. (If necessary heat again briefly to encourage the chocolate melting). Sit for 10 minutes then pour chocolate filling over caramel and leave to set – this will take at least 3 hours, but you can easily make it until this point the day (or even 2 days) before. Don’t store it in the fridge unless it’s really hot, but if you do, remove it from the fridge half an hour before serving. (If using Valhrona chocolate balls, leave the chocolate topping to set for two hours in the fridge before adding to the top). This looks delicious! There is an egg yolk and iced water listed in tbe ingredients for the filling, but I can’t see them mentioned in the method. Are they supposed to be in the base? is it unsalted butter we use for this ? we have double cream or whipping cream which we can whip to be super think, I’m thinking double cream ill try it with that thank you.